Taste sensation is characterized by a special and powerful chemosensory system which has an important role in drink and food physiological assessment and evaluation. Unlike olfaction, audition, vision, and touch, which serve in various behavioral conditions, related to behavior; taste sensation has developed to function as a major controller and driver of eating/drinking behavior. Gustatory systems are responsible for detecting “unsafe” substances in foods and drinks and therefore generate an innate (native) defense system that approves or denies potential food sources. Gustatory-salivary reflex yields a high flow rate secretion of stimulated saliva, rich in bicarbonate, in response to sour or low pH stimulation of taste receptor cells. Among all the five basic human tastes, sour taste has the greatest impact on the salivary flow. Miraculin (MCL) is a homodimeric protein that has a distinctive feature of altering the perception of sour tasting foods into sweet. The protein is extracted from berries, similar in size to olives, which grow on a tropical plant called Richadella dulcifica, a member of the Sapotaceae family found in West Africa. In general, when the taste buds are exposed to MCL, any sour foods and beverages containing citric or acetic acid will taste pleasantly sweet when consumed after this protein. This effect would last for 30–60 min. The molecular entity of the sweet taste receptor has been identified to be “human taste type 1 receptor 2 and 3” hT1R2-hT1R3. It is generally believed that MCL's mechanism of action is closely bound to the hT1R2-hT1R3 receptor. MCL has a huge molecular weight;, therefore, it is unlikely that the taste-modifying protein penetrates into the taste bud. Instead, it is believed to bind to the taste bud's cellular surface. It has been noticed that the taste-modifying protein possesses two binding sites; allosteric and catalytic. One is to bind the bud's surface and the other to bind the taste receptor site. As long as there is no acid applied, MCL should not bind the sweet receptor site. When an acid is applied, the pH will drop facilitating a conformational change to the taste bud which in turn will force the taste-modifying protein's binding site to “fit” the taste receptor eliciting its characteristic sweet taste. [Figure 1] illustrates the functional scheme for the sweet inducing mechanism of MCL based on the phenomenon that a sweet taste is elicited every time an acidic food or drink is consumed after MCL has been applied to taste buds. Since MCL itself is more or less tasteless and elicits sweet taste only when at acidic conditions, it was therefore believed that MCL would have a passive effect on hT1R2-hT1R3 at neutral pH. However, the same group of researchers has also demonstrated that the activity of MCL-pre-incubated hT1R2-hT1R3-expressing cells was inhibited after applying a sweet substance at neutral conditions. This inhibition also had a dose-related relationship which further demonstrates that MCL, after consumption, will be directly bound to the external cellular surface of the taste receptor where a very strong pH-dependant interaction occurs. When humans consume MCL, it strongly binds to the sweet taste receptor hT1R2-hT1R3 where it shows a state of equilibrium between being an agonist at low pH and an antagonist at neutral pH which inhibits the activation of taste receptors by other sweet substances. Moreover, MCL once bound to the receptor remains bound and able to activate/reactivate it depending on the pH state. This relationship can last for a period of around 1 h. however, this phenomenon and its effects have received limited research attention and the scientific findings in the field are highly varied and inconclusive. The aim of this work was to more fully understand the mechanism of action and subsequent effects of MCL and assess the effect of modifying the taste perception on the flow rate of parotid salivary secretion in human by utilizing MCL as a taste-modifying agent. Citric acid (Sigma-Aldrich Ltd., Gillingham, Dorset, UK) in its pure form was selected as the sour taste stimulant and sucrose (Silverspoon, Sugar Way, Peterborough, UK) as the sweet taste stimulant. Three different concentrations of citric acid were assessed, 4.4, 2.2, and 0.44 mg/ml. These values represent ×10, ×5 and ×1 the taste recognition threshold, respectively. In addition, three concentrations of sucrose were assessed; 34 mg/ml, 17 mg/ml, and 3.4 mg/ml which represent ×10, ×5, and ×1 the taste recognition threshold of sucrose in human taste buds, respectively. Following a pilot experiment (not presented), it has been decided to exclude tastants that were not fully recognized by participants, namely, citric acid ×1, sucrose ×1, and sucrose ×5. This will ensure that subjects will fully recognize all tastants as it was not the scope of this experiment to observe the effect of different tastants at sub-recognition concentrations [[Table 1], recognition thresholds according to Pfaffmann et al., 1971]. This experiment was conducted on seven adult participants (five males and two females). The volunteers involved were nonsmokers, had no history of systemic diseases, were on no medication known to alter salivary flow and function and had no history of the head-and-neck radiotherapy. After ethical approval was obtained from the Local Ethics Committee, the procedure was fully explained to the participants and written informed consent was obtained from each participant and a detailed questionnaire about food allergies was completed. The questionnaire ensured that participants with a history of food allergy were excluded from the study. The participants were asked to sit in a relaxed upright position. To obtain the salivary secretion of the parotid gland, sterile Lashley/Carlson-Crittenden cups (Stone Machine Company, Colton, CA, USA) were used according to the manufacturer's instructions. 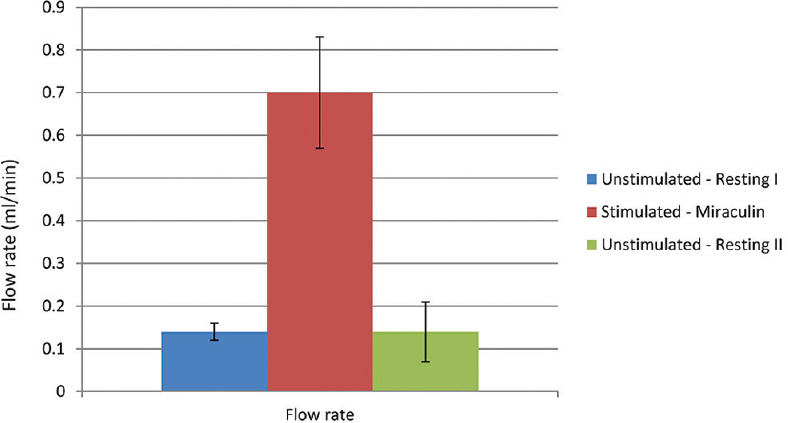 The flow rate in ml/min was calculated by dividing the volume of saliva obtained over the collection period. Measurement of the stimulated parotid salivary flow rate was undertaken by introducing 0.5 ml of each tastant every 20 s for 2 min via a sterile syringe. For each stimulus (i.e., tastant), the measurement was repeated three times at 3 min intervals. The participants were asked to consume a commercial MCL vehicle which comes in the form of tablets (Classic Miracle FrootiesTM). They were therefore instructed to roll around on their tongue one tablet for 2 min, allowing it to dissolve. The volume of saliva obtained over the 2 min was used to calculate the parotid salivary flow rate during the consumption of MCL. Once the tablet was completely dissolved, the same tastants were used again as gustatory stimuli using the same technique described above. During the application of different tastants, the participants were asked to describe the perceived taste for each tastant after the consumption of MCL using their own words. The conventional statistical significance of P < 0.05 was used throughout. The statistical software package, GraphPad Prism 6 (GraphPad Software Inc., San Diego, USA) was used. D'Agostino and Pearson omnibus normality test demonstrated that the data were distributed normally. To investigate any effects of different tastants with or without MCL on the salivary flow rate, statistical analysis using one-way analysis-of-variance (one-way ANOVA) on this data was undertaken. This revealed very highly statistically significant effects P < 0.0001. These effects were localized using (Tukey posttest) [Table 2]. 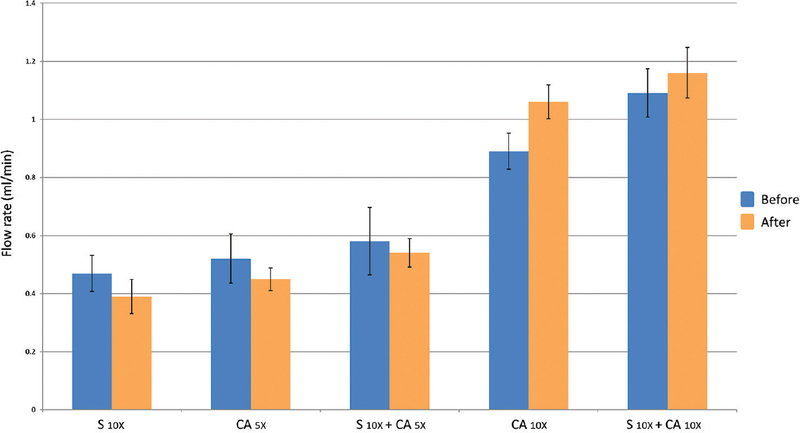 [Figure 2] shows that salivary stimulation by citric acid ×10 was considerably higher relative to citric acid ×5 and sucrose solution. This difference was found to be very highly significant (P < 0.001) (ANOVA). The mixed solution of sucrose and citric acid ×10 resulted in a higher stimulated salivary flow compared with that of any other tastant. This difference was also found to be very highly statistically significant (P < 0.001) (ANOVA). After consuming MCL, the overall trend remained comparable with that before MCL consumption. An increase in stimulated salivary flow rate was reported for citric acid ×10 and the mixed solution of sucrose and citric acid ×10 groups after consuming MCL. However, the salivary flow rate was reduced for all other groups (i.e., sucrose, citric acid ×5, and the mixed solution of sucrose and citric acid ×5) after the consumption of MCL. The mixture of sucrose and citric acid ×10 solution's effect on stimulated salivary flow rate was comparable to that of citric acid ×10 after the consumption of MCL (P > 0.05) (ANOVA). No effect of MCL consumption was reported on all tastants except citric acid ×10 which demonstrated statistically very highly significant difference (before vs. after) (P < 0.001) (ANOVA). However, this difference was found to be nonsignificant for the citric acid ×5 group. Resting salivary flow rate was found to be stable at 0.14 ml/min regardless before or after the consumption of MCL [Figure 3]. The stimulated salivary flow rate during the consumption of MCL was 0.70 ± 0.13 ml/min. Sucrose solution evoked the least parotid flow rate among other tastants. This result was expected because sweet taste evokes the least human salivary stimulation compared to other taste modalities., Interestingly, of the 35 taste perception descriptions obtained for the five tastants after the consumption of MCL (i.e., 7 subjects × 5 tastants), sweetness was always the perceived taste. The descriptions only differed in the degree of sweetness. [Table 3] further demonstrates this using the subjects' own words. It is therefore sensible to assume that parotid responses for sucrose and citric acid, after the consumption of MCL, reflected taste perception descriptions obtained from subjects particularly with the MCL-induced sweet taste after applying the ×10 variant of citric acid. All participants displayed almost the same overall pattern of salivary stimulation on the application of different tastants. This, we believe, demonstrates the precision of the method and the accuracy of the experimental set-up. Before the consumption of MCL, considerably higher mean parotid flow rates were generated after the application of citric acid ×10 compared with citric acid ×5 (P < 0.001). This is in agreement with a study that compared individual parotid flow rates and perceived taste intensity in response to different concentrations of citric acid. The MCL effect suppressed parotid salivary flow rates when both sucrose and the less concentrated acid solutions (i.e., citric acid ×5) were applied. The opposite occurred when the more concentrated acid solution was applied (i.e., citric acid ×10) where the mean parotid flow rates were increased. This coincides with the findings of Hyde and Pangborn where suppression of perceived sourness was only demonstrated in citric acid solutions of high concentrations. Another study reported that the addition of MCL to citric acid suppressed the perceived sourness which was matched with the successively reduced parotid salivary flow rate. These authors used low concentrations of citric acid solutions which are, more or less, comparable with the ×5 variant of citric acid utilized in this work. A noticeable similarity in the effect of a mixture solution of sucrose and citric acid and that of an MCL-induced citric acid solution was previously reported in the literature., This was also demonstrated in this work, wherein a mixed solution of sucrose and citric acid ×10 had a comparable effect on the mean parotid salivary flow rate to that of the MCL-induced effect of citric acid ×10 alone. While before the consumption of MCL the mixed solution evoked mean parotid responses that exceeded those for citric acid ×10 alone. Yet, this was not the case with the less concentrated variant of citric acid. It is, however, important to note that the previously hypothesized 'theoretical sum of responses' phenomenon was not reported in this work., Clearly, the theoretical summation of sucrose- and citric acid-evoked parotid responses in this work would be, by far, more than that shown by the mixed solution of both tastants. The results of this work rather suggest synergistic function of MCL as previously described in the literature. Interestingly, although not statistically significant, an inhibitory function of MCL was noticed with citric acid ×5 while a synergistic function of MCL was noticed with ×10 variant. Similar findings have also been reported previously in the literature.,, It is noteworthy that sucrose, as are sugars, cross adapts chorda tympani responses for citric acid. This might suggest that different tastant molecules will compete for the sour taste receptor sites which in turn might be dependent on the concentration of each. Parotid responses evoked by tastants before and after MCL where in agreement with the ones reported by Hyde and Pangborn where citric acid ×10 evoked a flow rate of 1.08 ml/min before MCL and 1.24 ml/min after MCL; whereas in this work, the flow rates of 0.89 ml/min before MCL and 1.07 ml/min after MCL was reported. However, in the aforementioned study, parotid responses evoked by sucrose and the mixture solution were different compared to those reported in this work. This is most probably attributed to the fact that different concentrations of solutions were used. Obviously, this sheds light on why it is difficult to compare results obtained in quite different experimental settings. The results of this work also reflect the fact that when MCL is bound to hT1R2-hT1R3, it would act as an agonist in acidic environments., Thus, the elevated parotid flow rates might be attributed to the activation of not only the taste fibers that respond primarily to sour taste but also by the activation of another group of taste fibers that are capable of simultaneously transducing intense sweet stimuli to the brain which would in turn render the sourness less intense if not absent. Nonetheless, other potential nongustatory inputs can also have an effect on parotid reflexes and the salivary flow, such as the oral irritation caused by acids that activate somatosensory afferents supplied by the trigeminal nerve. This paper has focused on the effects of modifying the taste perception on the parotid salivary reflex in man by altering the perception of sour to sweet. As expected, MCL-induced sweetness has evoked a significant increase in the parotid salivary flow. Further work needs to be carried out to characterize and more fully understand taste perception, quality coding, and binary taste interactions. MCL can enhance the flavor of otherwise bland-tasting foods. There has been a lot of interest among scientists in the protein's potential to replace sugar and artificial low-calorie sweeteners such as saccharin, thaumatin, and aspartame. This could have apparent advantages for patients with diabetes and people who want to lose weight. Moreover, MCL can make food taste better to cancer patients who had lost their appetites and also it can alleviate the metallic taste that arises as a side effect of chemotherapy. From a dental perspective, MCL has the potential to enhance the taste of sour tasting dental materials, such as acid-etching gels, restorative dentistry cement, and cancer-screening pre-rinses. Therefore, MCL may have promise in the near future to modify the taste of anything that is sour. An inhibitory function of MCL was noticed with citric acid 5x while a synergistic function of MCL was noticed with 10x variant. The authors are grateful to Professor M. Hector for valuable comments and stimulating discussions. Yarmolinsky DA, Zuker CS, Ryba NJ. Common sense about taste: From mammals to insects. Cell 2009;139:234-44. Bradley RM, Fukami H, Suwabe T. Neurobiology of the gustatory – Salivary reflex. Chem Senses 2005;30 Suppl 1:i70-1. Misaka T. Molecular mechanisms of the action of miraculin, a taste-modifying protein. Semin Cell Dev Biol 2013;24:222-5. Li X, Staszewski L, Xu H, Durick K, Zoller M, Adler E, et al. Human receptors for sweet and umami taste. Proc Natl Acad Sci U S A 2002;99:4692-6. Kurihara K, Beidler LM. Taste-modifying protein from miracle fruit. Science 1968;161:1241-3. Theerasilp S, Hitotsuya H, Nakajo S, Nakaya K, Nakamura Y, Kurihara Y, et al. Complete amino acid sequence and structure characterization of the taste-modifying protein, miraculin. J Biol Chem 1989;264:6655-9. Koizumi A, Tsuchiya A, Nakajima K, Ito K, Terada T, Shimizu-Ibuka A, et al. Human sweet taste receptor mediates acid-induced sweetness of miraculin. Proc Natl Acad Sci U S A 2011;108:16819-24. Pfaffmann C, Bartoshuk LM, McBurney DH. Taste psychophysics. In: Taste. Berlin, Heidelberg: Springer; 1971. p. 75-101. Kawamura Y, Funakoshi M, Nishiyama T, Majima T, Kamada A. Relations between taste qualities and parotid gland secretion rate. Nihon seirigaku zasshi. J Physiol Soc Japan 1964;26:495-502. Hyde RJ, Pangborn RM. Taste modifiers: Parotid reflexes can differ from taste judgements. Chem Senses 1987;12:577-89. Bartoshuk LM, Gentile RL, Molkowitz HR, Meiselman HL. Sweet taste induced by miracle fruit (Synsepalum dulcificum). Physiol Behav 1974;12:449-56. Feller RP, Sharon IM, Chauncey HH, Shannon IL. Gustatory perception of sour, sweet, and salt mixtures using parotid gland flow rate. J Appl Physiol 1965;20:1341-4. Putney JW Jr., McKinney JS, Aub DL, Leslie BA. Phorbol ester-induced protein secretion in rat parotid gland. Relationship to the role of inositol lipid breakdown and protein kinase C activation in stimulus-secretion coupling. Mol Pharmacol 1984;26:261-6. Lawless HT. Evidence for neural inhibition in bittersweet taste mixtures. J Comp Physiol Psychol 1979;93:538-47. Bartoshuk LM. Taste mixtures: Is mixture suppression related to compression? Physiol Behav 1975;14:643-9. Oakley B. Taste responses of human chorda tympani nerve. Chem Senses 1985;10:469-81. Miller GA. The magical number seven plus or minus two: Some limits on our capacity for processing information. Psychol Rev 1956;63:81-97. Diamant H, Hellekant G, Zotterman Y. The effect of miraculin on the taste buds of man, monkey and rat. In: Olfaction and Taste IV. Stuttgart: Wissenschaftlige Verlagsgesellschaft MB4 Stuttgart; 1972. p. 241-4. Brouwer JN, Glaser D, Hard Af Segerstad C, Hellekant G, Ninomiya Y, Van der Wel H, et al. The sweetness-inducing effect of miraculin; behavioural and neurophysiological experiments in the rhesus monkey Macaca mulatta. J Physiol 1983;337:221-40. Kawamura Y, Miyake Y, Miyoshi K. Studies on interrelationship between mandibular movement and parotid secretion. J Osaka Univ Dent Sch 1969;14:37-41.